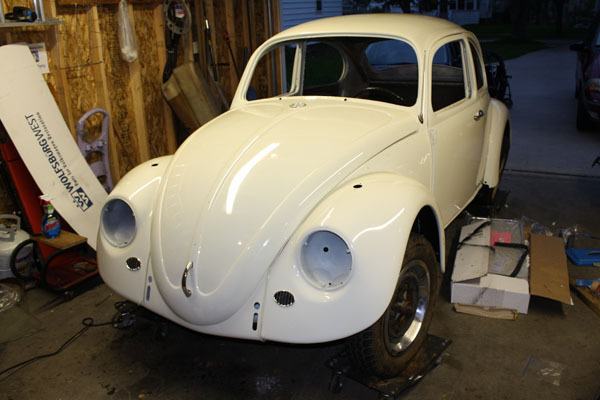 Tell us about the history of your ’67 Beetle? I grew up with a beetle. Mom had a ’68 savannah beige auto stick she bought brand new. I was born in ’73 so my earliest memories include that VW. We moved to Florida in 1988 and left the VW behind. 20 years of Wisconsin winters and road salt had taken its toll. No matter what, vintage cars remained in my blood. An hour later I was walking around the block and saw this beetle sitting in the front yard of a house. It had a FOR SALE sign in the window. I stopped and talked to the owner. His name was Herb Burgart. I ended up working out a deal to buy the car. A few weeks later she was mine! Herb had to drive the car to my house because I couldn’t drive stick. Fast FWD. One day on my way home the beetle started to spit and sputter. I looked in the rear view mirror only to see flames. I grabbed a fire extinguisher and quickly handled the situation. As it turned out, the pressed fitting on my fuel pump fell out. The fuel filter was actually still intact, just melted a little. All in all, no real damage. Whew! In summer of 1992 my parents moved back to our home state of Wisconsin. 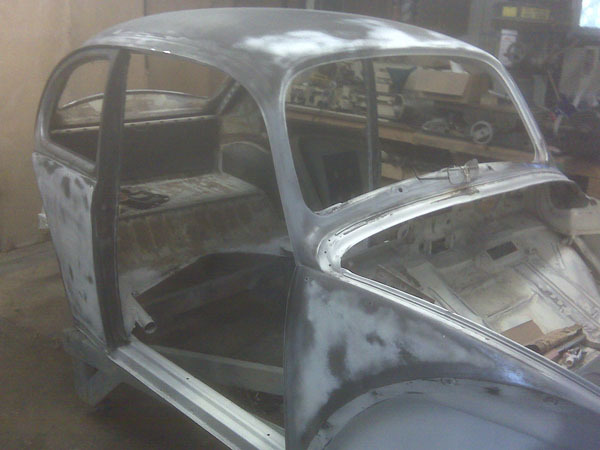 I brought my beetle and began the restoration. On March 13th 2000, the place where my beetle was stored was foreclosed on. One day the movers came and took everything including my ’67 and ’72. I got a hold of the company and they said I needed to “pay $150 in towing fees” to get the cars back. The owner of the foreclosed property told me not to get them yet because he was going to sue the bank for grand theft and he would give me part of the settlement. A few months went by and I decided to get my car anyway but the number was now disconnected. I tried to locate where they went but just like that the cars were gone. 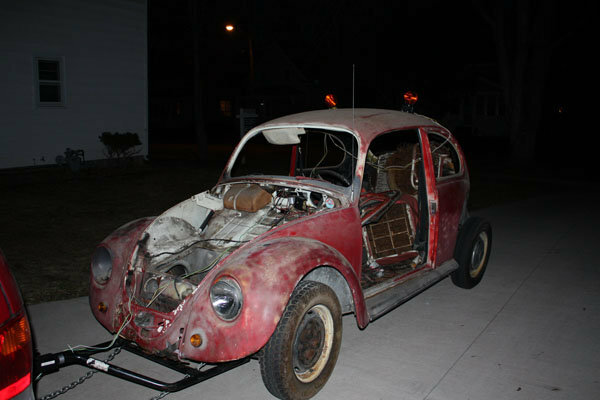 On March 14th 2010, ten years and one day from the loss of my beetle, I got home from work late, sat down, and started searching classifieds. An ad caught my eye; it was a ’67 beetle for $600. I clicked on it and said “holy err ‘cow.” My wife knew right away. It was my car! I went and picked my ’67 the next day, It sucked that I had to buy the car twice, even though I had the title. A friend said I should show up with the Sheriff and say the car was stolen 10 years ago. 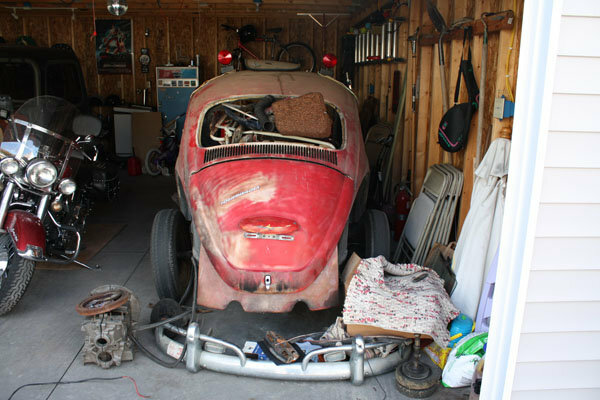 The car was stored in a barn. It was still in great shape, but a lot of the small parts, which I had removed some 15 years earlier were missing. It turned out that the company that removed the cars went out of business shortly after I talked to them. When did you start the restoration? I always tell people I started the restoration the day I bought her back in 1990. But to be realistic, I started in 2010. Well, as of today she is still “work in progress.” I would have to say the work is about 60-70% complete. 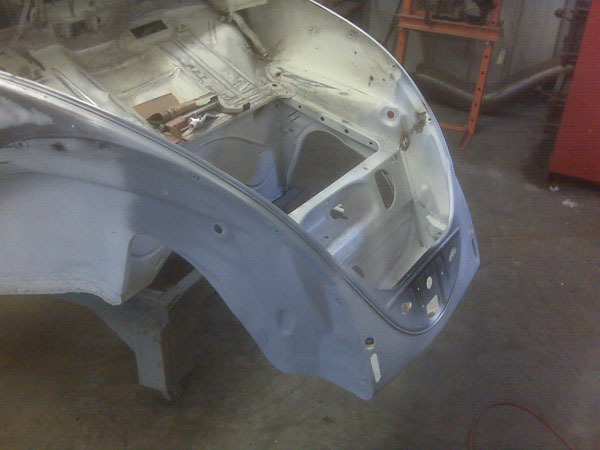 Pretty much all the mechanics are put back together; all that is left is wiring and finishing off the interior. What were some of the challenges you faced during the process? The first thing was to find someone to fix the front-end damage. I didn’t want some bonehead with a cutting torch to mess with my baby. Luckily, I found Mark Massey, of Old VW Restorations. He’s about 40 minutes from me and does awesome work. He grafted on the new front apron and painted her. I can’t tell you how happy I was! And best of all, he treats your car like it is his very own. The other thing was to find a good supplier of quality parts. There are so many venders that gladly offer poor quality. In your opinion, what makes the ’67 Beetle so unique? The ’67 is unique because it is a hybrid, taking from both the old style beetle and the new style beetle, which is what attracted me to this year. You have those awesome bumpers with the overriders, low back seats; you have to open the hood to gas up. Then you have the 12-volt electrical system and the bigger engine. What parts were the hardest to find? I thought it would be the doors, seats, front clip, or hood, but those turned up as soon as I started looking. At this point in the restoration, the hard thing is that silly air cleaner bracket. I know they are out there, it’s just taking time! I have to say, The Samba has been a great resource to find parts. I now that I am in the home stretch and am sure I will realize other parts I need. Stay tuned for Part 2 of this interview. What is your take on doing a 100% stock restoration VS non stock? It really is up to the owner. You have to follow your heart and listen to your VW. That being said, I really hate to see someone cut into perfectly good German steel. I know some guys that are total purist, if you even have the wrong tires on your car, they won’t talk to you. I am not that way, I love to see a perfect stock car, but I enjoy a slammed bug with a big engine. Any ’67 Beetle specific tips or words of wisdom you would like to offer? TAKE YOUR TIME! Do a lot of research. 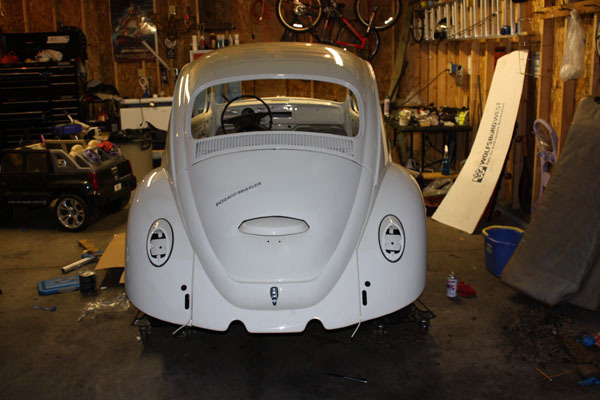 Find fellow enthusiasts like Eric Shoemaker here at 1967Beetle.com to ask questions. He’s a wealth of knowledge. I kick myself for not emailing him sooner. Don’t rush to get something together and end up destroying the part; I have done it. It’s is not worth it. Whatever you do with your restoration, drive and enjoy it! I keep a restoration bog, but have been a little slow updating. Here’s a video of us putting the body on. Thanks 1967beetle.com! 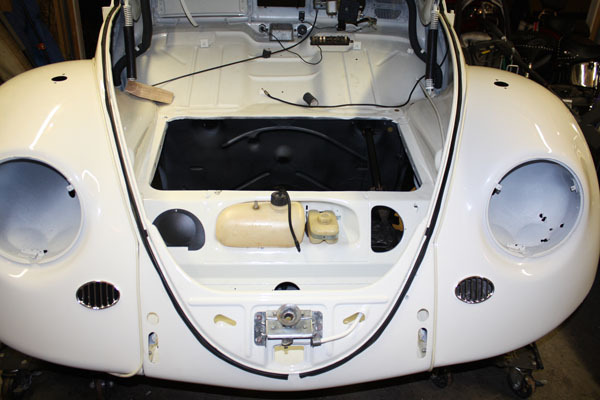 Thanks Rich for sharing your story with 1967beetle.com. Greetings 1967beetle.com! Great site. My husband and I own a ’66 and a ’67. Hello from Germany! We are loving what you’re doing with these photo stories. Das Auto! Cool story of this 67. Buying your own car back hurts but worked out. I’d buy back my ’67 if I had to… :) Thanks for reading Timm. Liebe wirklich die site! Hallo aus Deutschland. Nice car… It would be really hard to sell with so much time & work invested! cool site! 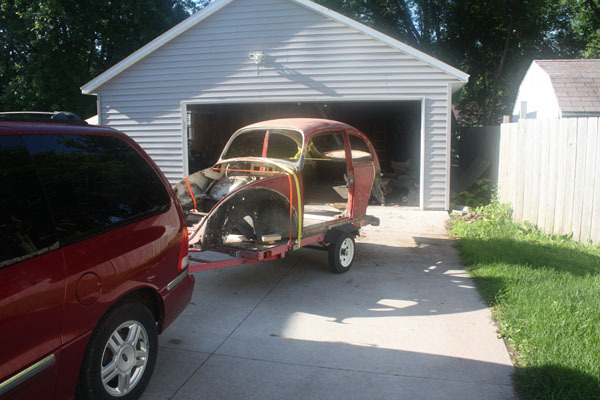 i just finished a 78 mexican beetle conversion back to a 67 beetle and am recently building a real 67 beetle into a baja bug! just visit my blog http://www.prostreetnotch.blog.de . Thanks! Let me know if you have any questions about your project. I know the ’67 very well! An older article we wanted to shine some light on once again. Well the 67 only went for $2,075.00 on Ebay. Someone got a very good deal ! Yeah, the seller just let me know…. You’re right. Hi, Herb Burgart here. They guy who had the car back in 1990. Can’t believe I ran into this article. Nice job with the car. My dad and I had bought this car back then to travel to Mexico. We didn’t use it for that but I remember the kid who bought it and I remember him telling me that it caught on fire.